Niels Engel’s musical career started at the Conservatory of Esch-sur-Alzette (LU) where he studied mainly classical music (clarinet, classic percussion, solfeggio, classic harmony, chamber music, orchestral playing, brass band). After some years, he got more and more into jazz music and especially into drums and took lessons in jazz drums at the Conservatory of Luxembourg. 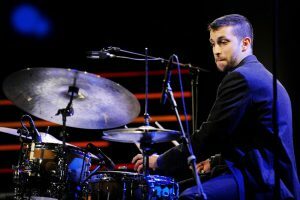 At the age of 16, he won the “Young European Soloist Competition” in Luxembourg and became a finalist of the “European Drummer Competition” in Germany a year after. At the age of 18, he finished his degree in drums from the Conservatory of Esch-sur-Alzette. After this training, he got accepted at the Royal Conservatory of the Hague (NL) where he studied jazz drums with Joost Patocka, Stefan Kruger, Frits Landesbergen and Erik Ineke. In 2009, he moved to Amsterdam to finish his bachelor’s degree with Marcel Serierse and Martijn Vink at the Conservatory of Amsterdam. In 2010 he won prestigious competitions as a sideman such as the “Prinses Christina Concours” and the “Grote Prijs van Nederland”. In 2013 he won with the “Matiss Cudars 4tet” the famous “European Burghausen Jazz Award” in Germany. He currently plays in different formations and groups such as the Luxembourg Jazz Orchestra, the Orchestre National de Jazz de Luxembourg, Pol Belardi’s Force, Marc Mangen Trio, BEAM, Ernie Hammes Group, Jasper Blom 4tet, David Ascani 4tet and more. Since 2016, he teaches drums at the Conservatory of Esch-sur-Alzette.